"No news is good news", especially in the evil world of politics where the world's most effective psychopaths ply their trade, to humanity's detriment. In the context of this blog, a lack of compelling news also gives us opportunity to discuss matters other than national politicians and mass murderers (but I repeat myself). "Iron Man" actor Robert Downey, Jr. has for many years shared with the world his hilarious wit and (in the past had) fueled the tabloids with his drug problems. He also enraged the Hollywood PC police by revealing politically conservative tendencies. Unlike George Clooney, Downey seems more low-key about his politics. Any brouhaha about his political views is more about his having these views at all, rather than about his shoving them in anyone's faces. Conservatives, of course, form not the more unified spectrum that populates the Left. They are, instead, an alliance of three (or four) groups which have different priorities and different astrology. We can use astrology to help us see what sort of "conservative" Downey is, and also shed light on non-political facets of his personality. Apollonian: Pallas trine North Node and ruled by Uranus and Saturn which are square the Nodes. Dionysian: Pallas quincunx Pluto and ruled by Uranus which is conjunct Pluto and by Saturn which is opposite Pluto. Downey is strong in both Apollonian and Dionysian factors, but the Apollonian factors are Node-related. On "The Axis of Good and Evil" this likely puts him into the "Criminal" category early in life, but suggests a high likelihood he will gradually move toward the "Libertarian" quadrant over time. I call this a "whistleblower" configuration, as whistleblowers very often have these Nodal configurations with Pallas. Collectivist: Venus trine South Node. Downey is no Ayn Rand acolyte. Liberal: Neptune in the Fourth House opposite/contraparallel the Moon and Fourth House ruler Jupiter. Hyper-liberal in the social sense. The older he gets, the harder it will be for him to retain a mainstream-Left world view. He's not conservative in the least: he's a libertarian waiting to hatch out of a "liberal" shell. There is no guarantee that he will actualize this potential, however. Sun/Venus - Ascendant - South Node (on Fifth House) Grand Trine: brilliant superstar, losing himself. 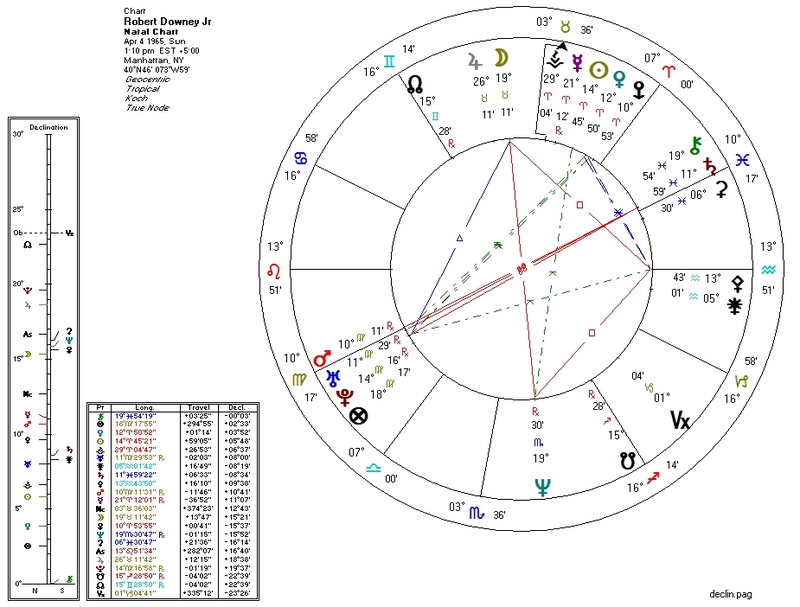 Neptune in the Fourth House opposite/contraparallel the Moon and Fourth House ruler Jupiter: very likely related to his drug problems. Sun conjunct Venus in Aries: aggressive charm. Pallas on the Descendant: probably also related to charm. Sun conjunct retrograde Mercury in Aries: those hilarious rapid-fire under-the-breath quips. "Iron Man". The Second and Eighth House emphasis here also reflects the billionaire comic-book hero. The Taurus MC and Leo Ascendant mirror Donald Trump.